Time for you and your friends to shut down that search engine and find out what you really know. Ever had that experience where a word, a name, or a fact was on the tip of your tongue but still just out of reach? 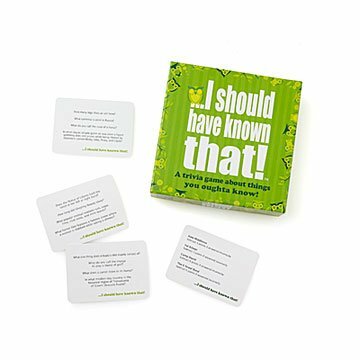 Well, this trivia set transforms that moment of awkwardness into a hilarious group activity. Instead of questions about ancient history and things you've never heard of, it contains more than 400 questions on movies, pop culture, and recent eventsthings you should know all about, right? For example, does the Statue of Liberty hold her torch in the left or right hand? Date night or family trivia night, you'll discover that sometimes being stumped makes for all kinds of fun. Made in Poland. We enjoyed playing this game during our Christmas game night. The game was easy to play with well written instructions. We play adults vs kids but this works better with mixed teams. We also put a time limit to give an answer. Fun game to play at any occasion! Great game for groups, or just two people. Flexible and fun. There was four of us so we didn't make teams. The first time we played we kept score but after that we just had fun asking the questions.